In the North Myrtle Beach area, a fireworks worker was seriously injured after an explosion on the Cherry Grove Pier. 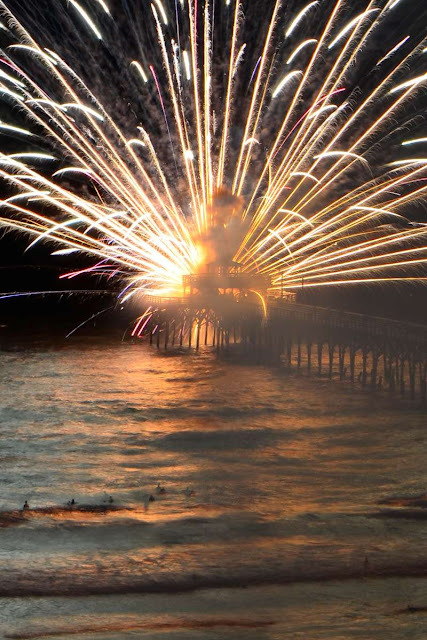 From WMBF: The show ended about six minutes after starting when the shell exploded, injuring the Zambelli Fireworks worker, blowing an estimated two-by-three-foot hole in the pier, and damaging about four feet of pier railing, stated North Myrtle Beach information officer Patrick Dowling in a news release. This picture is from David Roe courtesy of WMBF. Very sad sight on the Grand Strand.